At The Radh Hotel in Kandy, we’ve been providing such an exemplary standard of service to all our guests that our esteemed guests are so full of praise about us. Also, every day, we continue to improve steadily in all major aspects of guest experience. To pull it off, we connect with our guests closely, benchmark, and raise the bar on the overall quality of our services. Close to the Temple of the Tooth, the room was fairly tight but had adequate space, and was well appointed. Staff were very helpful and attentive. Breakfast was very good with lots of variety. Be aware that in the evening the restaurant is devoted to sushi, and no alcohol is served due to its sensitive religious location. We had 3 nights here at the start of our holiday. Ideal location for walking to places and easy to get a tuk-tuk for further trips. Very friendly staff. Room very clean with a couple of very small issues which did not detract from our stay. Breakfast was excellent, especially the egg droppers. Good range of food available. There are many great things to rave about this hotel and the team. - Amazing customer service by everyone - the whole team are super friendly, all smiles and nothing is too big to ask them about - special call out to Sarge on the front office, she helped out to research a specific need for us and came back with many options very quickly and generally was very informative about what to do in Kandy. - Love that you have two pillow options - firm and soft. Very comfortable bed and finishes. - they have really thought about the full customer experience - mini bar (although limited) is complimentary as with water, premium teas. It isn't the biggest of hotel rooms so it may not suit everyone's needs but just remember its right in the busiest area of Kandy - you have all the tourist sites at your doorstep. Big thanks to the Radh team! We stayed 2 nights at Radh hotel, we felt very welcome as soon as we arrived. Sargee on the front desk is excellent at her job, so accommodating & informative. She went above and beyond to make us feel welcome, showing interest in our lives & also sharing her hobbies & interests with us. Thank you for the crochet gift, I will always remember you. Our room was small but well equipped to a high standard. I loved the shower, & the bed was very comfortable. Breakfast was very good with everything you could wish for. The jewellery man made us chuckle every day trying to entice us into his shop, but he failed to draw my partner in so I left without a beautiful ring ☹️ My only criticism would be that the A/C wasn’t very cool & we struggled sleeping due to being so hot, maybe we didn’t have it on the right setting. Other than that I highly recommend this hotel for visiting Kandy as it's in an ideal location. Thank you, hotel Radh. Spent 2 nights in this hotel and had the best sleep of the whole trip. The beds and bed linen were 1st class and the shower just divine. Breakfast was very good, great choices and the service from start to finish was excellent. Wow. The Radh Hotel offers an incredible experience. My wife and I came on our honeymoon and left starstruck. The Radh management has thought about every possible aspect of making your stay more comfortable. From the king coconut water with lime when you step through the door, to the delicious food at the Japanese restaurant, to the beautifully designed rooms. One of the best hotels we've ever stayed at. Hands down. My wife and I had the best stay in Sri Lanka at the Radh. Honestly it is the best hotel in the country in that price range. The staff is extremely friendly and helpful. They really think and plan in a helpful way and know all ins and outs of Sri Lanka and travelling through the county. They made our stay unforgettable. The rooms are spacious and luxurious. Modern architecture in an old building creates a unique atmosphere. The room has all you need including a good hot shower and fast internet (and in Sri Lanka, both at the same time is rare ;) ) So to conclude you can not miss this place if you’re planning to come to Kandy. We had a terrific stay at the Radh hotel in February. The location couldn’t have been better and the service was impeccable. The room was very comfortable and we were gifted a room upgrade upon arrival. All the staff take great care in ensuring your every need is taken care of. The breakfast is incredible with by far the best coffee in all of Kandy. We also tried the in house restaurant for dinner and it exceeded expectations. Great Japanese cuisine. From check in to check out this was an excellent hotel with 1st class service from the staff who went above and beyond to cater for our needs. Great decor & contemporary feel and everything you want to make your stay comfortable right in the middle of Kandy literally footsteps to the relic temple. We visited with our two teenage children. Our room was amazing, with plenty of space, very modern facilities and a wonderful jacuzzi on the balcony. The hotel is less than 6 months old and everything still feels lovely and fresh. The beds were super comfortable and despite being on a busy road the noise stopped around 9 pm and we all slept well. The staff were incredibly friendly and keen to please. We had room service and ate in the restaurant one night and both were very good. Breakfast had a good selection of local and western choices. Location is 1 minute to the temple of the tooth. The hotel does not serve alcohol but we had a few drinks in our room and there are plenty of bars nearby. After a busy day exploring Kandy it was wonderful to know we were coming back to our oasis at the Radh. The hotel was opened just few months ago, and everything is new and modern (very modern!) . The stuff is amazing, and do everything they can to make you feel good. The location is in the middle of the city, with many restaurants around. The temple is also 5 minutes walking distance. Not like most of the other hotels that are located in the mountains, where you need a taxi for every move. A lot of small surprises like JBL player, welcoming tea and fruit dish, etc. Go there! A jewel in a busy city. The Radh is a perfect hotel to explore Kandy. It is centrally located, very comfortable with attentive staff. The restaurant is excellent and the staff always willing to assist with questions about the food or assisting with places to see. This very beautifully appointed boutique hotel is just down the street from the famed Temple of the Tooth which means you have incredibly easy access to one of Sri Lanka's most significant Buddhist experiences. I also mean you can walk in old town Kandy and around the lake and get a feel for this important city without needing a driver. It's also close to the train station, a quick tuk tuk away and that means you can take the famed Kandy-Ella route with little stress. This new hotel boasts all the modern conveniences and more in terms high tech operation systems. Be sure to have hotel guest relations take enough time to explain how everything works because everything does function very well, it can just be a tad confusing at first. A very small hardship indeed, since the modernity speaks to the hotel's effort to provide every convenience. Kandy can be a lively place but we had a room in the back on the 4th floor and it was very peaceful. And, the room was exquisitely designed. Bear in mind, it is a small boutique hotel in town so the rooms are cosy but very well laid out. And, the staff are all exceptional. Attentive, friendly and extremely helpful. I'm afraid I didn't write the name of the front desk/reception manager's name. At least, I think she was the manager. She was first rate. She made sure we were comfortable, helped us find a terrific Indian restaurant on the next street over. (Can't remember it's name but just ask - it serves delicious cuisine.) Even better, she made sure that we were served an authentic Siri Lankan breakfast each morning we were there. And the food was simply delicious. 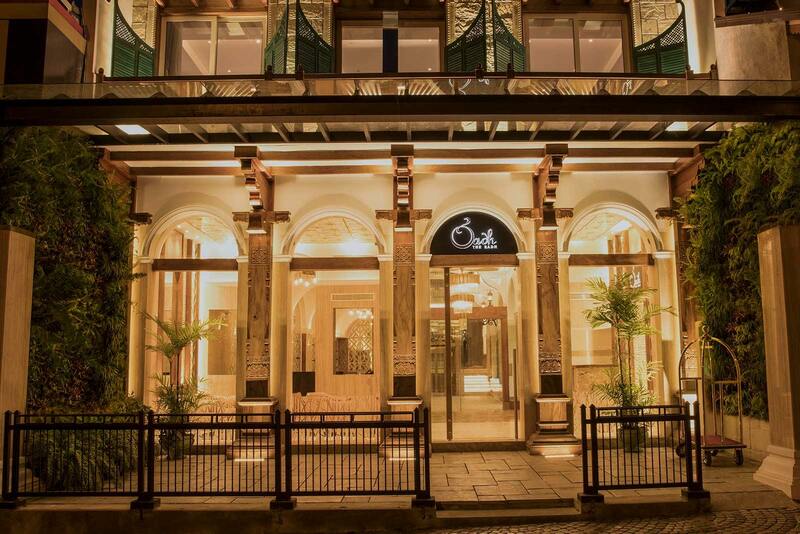 If you're looking for an Kandy experience that is in town and close to the temple, you can't possibly go wrong with this beautiful boutique hotel. Since the moment of arrival the staff was very welcoming and really accommodated our every need. The food was absolutely delicious and the portions were very generous, highly recommend the Radh Special Biriyani and the mushroom soup. Besides they have the best Japanese restaurant as well, cafe nihonbashi never failed to please us with their food. Rooms are super spacious and comfortable to the maximum. Every little detail is attended to and most importantly for us we had wall sockets just near the bed which was very useful. Highly recommend the place if you are interested in staying in a cozy boutique style place with a great location.